To be honest, I didn’t know this until after booking my tickets…but we’re about to fly into the “one of the world’s most violent places” a.k.a. 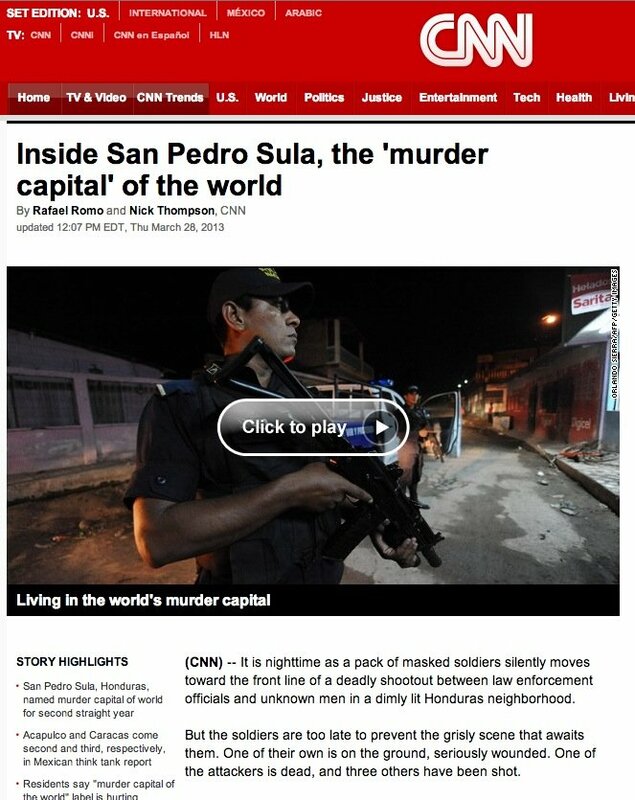 The Murder Capital of the World: San Pedro Sula, Honduras. You might be thinking, Oh, Calvin, you CHOSE this place for that designation. But I’m telling you honestly: I had no frickin’ idea. And a disturbing photo gallery on Reuters. I had told myself once that the city that would make me the most nervous heading into would be Ciudad Juarez, Mexico, where indiscriminate killings has been the norm. 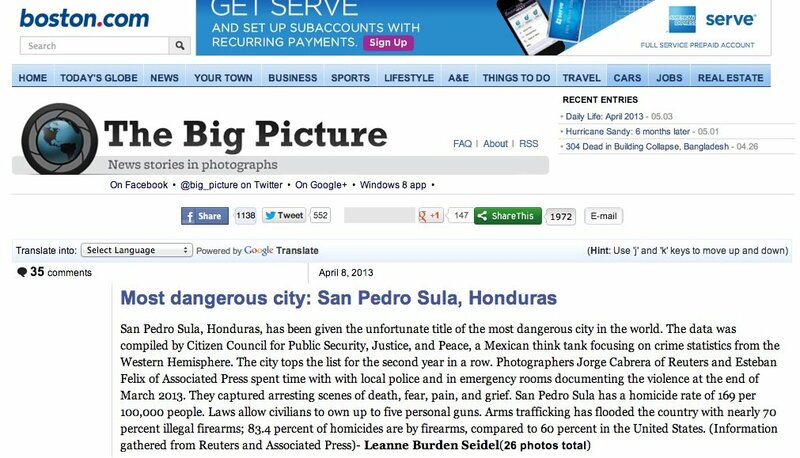 How would you think I feel about learning that San Pedro Sula has already surpassed Ciudad Juarez this year in number of murders per 100,000 people? The Department of State continues to warn U.S. citizens that the crime and violence levels in Honduras remain critically high. This Travel Warning supersedes the Travel Warning dated November 21, 2012, to include additional information about reported kidnappings, information for victims of crime, as well as the Honduran police force’s ability to respond to reports of crime, and also serves to update contact information. Tens of thousands of U.S. citizens visit Honduras each year for study, tourism, business, and volunteer work without incident. However, crime and violence are serious problems throughout the country and the Government of Honduras lacks sufficient resources to address these issues. 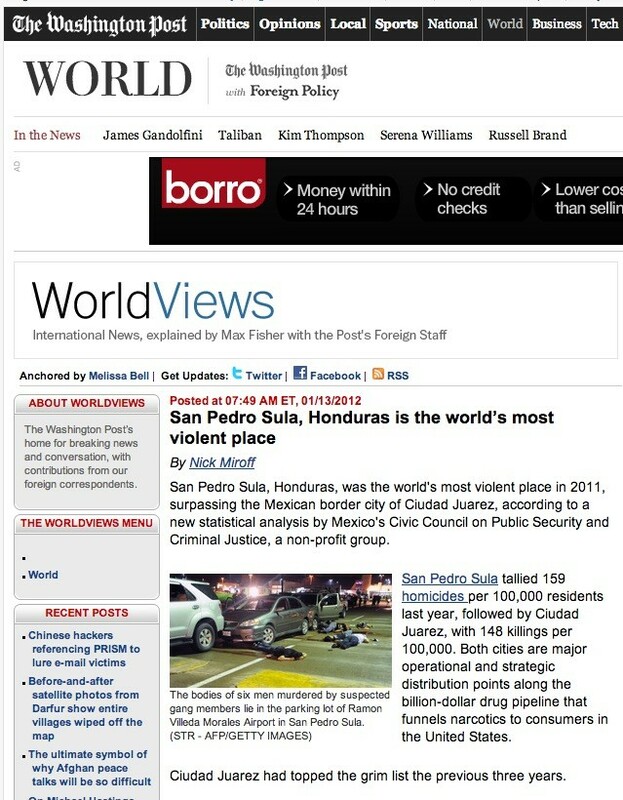 Honduras has the highest murder rate in the world. These threats have increased substantially over the past several years and remain high. Incidents can occur anywhere. U.S. citizens do not appear to be targeted based on their nationality. Crimes are committed against expatriates at levels similar to those committed against locals. Most resort areas and tourist destinations have lower levels of crime and violence than other areas of the country, though still high by international standards. Moreover, tourists traveling with group tours report fewer criminal incidents. In 2012, the government agreed to increase police presence in areas frequented by tourists, such as the Copan Mayan ruins and Roatan. The government also established special tourist police forces in Copan and Roatan and is evaluating this option in other locations. Additionally, major hotels and other tourist installations have increased security, including with the help of police, in response to the crime epidemic. These efforts are in various stages of implementation. A majority of serious crimes are never solved; of the 18 murders committed against U.S. citizens since January 2011, police have closed none. Members of the Honduran National Police have been known to engage in criminal activity, including murder. The Government of Honduras lacks sufficient resources to properly investigate and prosecute cases, and to deter violent crime. In practice, this means police may take hours to arrive at the scene of a violent crime or not respond at all. The police often lack vehicles or fuel to respond to calls for assistance. As a result, criminals operate with a high degree of impunity throughout Honduras. The Honduran government is in the early stages of substantial reforms to its criminal justice institutions. Transnational criminal organizations conduct narcotics trafficking and other unlawful activities throughout the country and use violence to control drug trafficking routes and carry out other criminal activity. Other criminals, acting both individually and in gangs in Tegucigalpa and San Pedro Sula, commit crimes such as murder, kidnapping, carjacking, armed robbery, rapes, and other aggravated assaults. Kidnappings and disappearances are an ongoing concern throughout the country. Kidnapping affects both the local and expatriate communities, with victims sometimes paying large ransoms for the prospect of release. Kidnapping is believed to be underreported. Since January 1, 2012, four cases of U.S. citizens being kidnapped were reported to the U.S. Embassy. The kidnapping victims were all subsequently released. U.S. citizens should be vigilant of their surroundings at all times and in all locations, especially when entering or exiting their homes, hotels, cars, garages, schools, and workplaces. Whenever possible, U.S. citizens should travel in groups of two or more persons; avoid wearing jewelry and carrying large sums of money or displaying cash, ATM/credit cards, or other valuables; and avoid walking at night in most areas of Honduras or walking alone on beaches, historic ruins, and trails. Incidents of crime along roads, including carjacking and kidnapping, are common in Honduras. Motorists should avoid traveling at night and always drive with their doors locked to deter potential robberies at traffic lights and on congested downtown streets. There are not reliable statistics for the department of Gracias a Dios, however travelers to this area should note that it is a remote location with limited government services and frequent presence of narcotics traffickers. Well, there you have it. This ain’t Disney World anymore. Time to not be stupid. So wish us luck, because we’re already here.